I so hope this finally fixes my Kopete TLS problems! Need to wait for the Kubuntu packages to appear..
Update: the Ubuntu Jaunty packages are currently in the Kubuntu experimental PPA. Downloading now.. 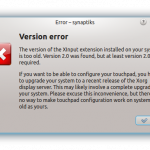 This entry was posted in KDE, Linux by Chris Samuel. Bookmark the permalink.